1. Up to thirty-thousand (30,000) rubber ducks will be available for adoption and entered in the race. Ducks may be adopted from members of the Rotary Club of Daniel Island (“Lead Participating Club”) or from members of six other Rotary Clubs participating in the adoption of ducks (“Other Participating Clubs”) – East Cooper Breakfast Rotary, Rotary Club of Mount Pleasant, Rotary Club of North Charleston, Rotary Club of North Charleston Breakfast, St. Johns Parish Rotary Club, and Rotary Club of Summerville. Adoption forms may also be found, and adoptions processed online, at https://www.charlestonduckrace.com. The Lead Participating Club and the Other Participating Clubs are seeking both individuals and businesses to adopt ducks for a suggested donation of $10 per duck. Approximately thirty-thousand (30,000) ducks will race regardless of the number adopted, but if fewer than 30,000 ducks race, all adopted numbers will be in the race. Winners will be determined by the first adopted ducks to cross the finish line. Chances of winning depend on the total number of qualified entries. 2. Ducks will be dropped into the Lake on Smythe Park on Daniel Island at approximately 6:00 PM on or about June 1, 2019; it is possible the date and time of the race will change and the most current information will be posted on the Charleston Duck Race website at https://www.charlestonduckrace.com. Ducks will be propelled toward the finish line by water sprayed by the City of Charleston Fire Department. Weather conditions or other interference may affect race time. The Lead Participating Club reserves the right to change or alter the starting location or method at its discretion. If extreme circumstances beyond the reasonable control of the Lead Participating Club prevent the completion of the race from occurring at the announced date and time, winners will be determined by a random drawing of adopted duck numbers. Such drawing if needed will be scheduled and conducted by the Lead Participating Club. 3. All rubber ducks shall remain the property of the Lead Participating Club, and handling and possession of the ducks will be by the Lead Participating Club only. Prior to the beginning of the race, a unique number will be assigned to each duck adoption; each adoption will be assigned one number. Multiple duck adoptions on one entry form will be assigned multiple duck identification numbers. Each assigned number will correspond to a unique number associated with one of the rubber ducks in the race. Prizes will be awarded to the adopters whose names appear on the adoption forms corresponding to the qualifying ducks crossing the finish line in the order detailed in paragraph 4, below. A list of adopters and their corresponding duck numbers as of 6:00 PM of the day prior to the race will be posted at the event prior to the start of the race. 5. Prize winners will be announced following the race. If a minor wins any of the prizes, that prize will be transferred to the minor’s legal guardian. Winners do not need to be present to win. When necessary, winners will be notified by telephone, electronic mail, or US Mail. If a winner does not claim his/her prize from the Lead Participating Club within 30 days of the conclusion of the race, the Lead Participating Club reserves the right to select an alternative prize winner through a random drawing of adoption numbers. A list of prize winners will be posted at https://www.charlestonduckrace.com within 48 hours of the conclusion of the race (or drawing, if needed). By adopting one or more ducks adopters release the Lead Participating Club and the Other Participating Clubs and their officers, directors, members and other related entities from any and all liability with respect to prizes. All local, state, and/or Federal taxes are the sole responsibility of the prize winners. When required, Federal and South Carolina taxes will be withheld from winnings. By adopting a duck, winners consent to the promotional use of their names and likenesses by the Lead Participating Club and/or Other Participating Clubs without additional compensation. 6. The entry portion of each adoption form must be completed and delivered to the Lead Participating Club or Other Participating Clubs, either physically or via electronic means on the website https://www.charlestonduckrace.com, by 5:00 PM of the day prior to the race; any adoptions received by mail or electronically after that time may not be eligible for prizes. No further adoptions will be accepted by any means after all available ducks have been adopted. If not all ducks have been adopted prior to race day, adoption forms and donations may be accepted at the event up until race time. Mailed adoption forms must be sent to the address found on the form. Entrants assume the risk of non-delivery of any entry. Completed forms can be delivered by hand to an authorized representative of the Lead Participating Club or of the Other Participating Clubs. 7. This event is subject to all federal, state and local laws and regulations and is void where prohibited by law. 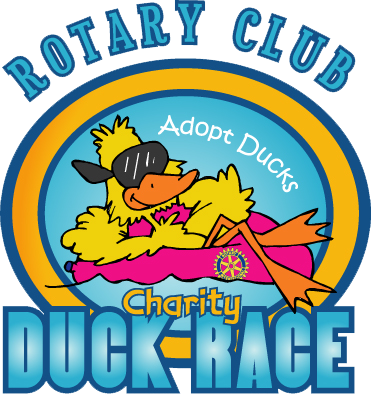 The Rotary Club of Daniel Island, Rotary Charity Duck Race and its logo are the property of the Lead Participating Club and no other person or entity is authorized to copy or use them without the express written consent of the Lead Participating Club. 8. The Lead Participating Club and the Other Participating Clubs reserve the right to distribute net proceeds at their own discretion. For further information regarding the intended use of proceeds see https://www.charlestonduckrace.com. 9. No one is ineligible from participating in duck adoptions. Rotary Club of Daniel Island and the Other Participating Clubs’ members, spouses, household members, and all sponsors are eligible to win. The Lead Participating Club asserts the validity and integrity of the event, and welcomes anyone to witness the race. Inquiries may be mailed to Rotary Club of Daniel Island – Rotary Charity Duck Race, 295 Sevens Farms Drive, Suite C, PMB#149, Charleston, SC 29492, or you may use the form on the race website.